Note: I tried the write out this patterns as simply as possible, but I wanted to include this note as well. 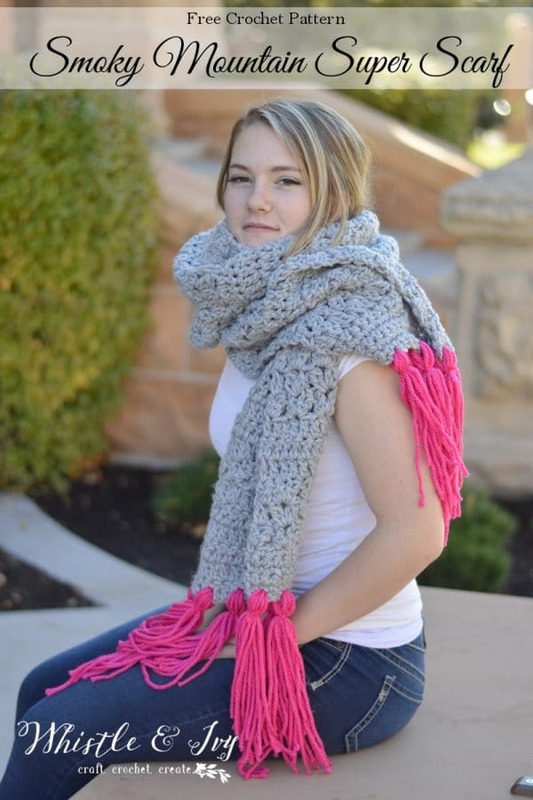 This scarf is worked in straight rows of DCs, but it has rows with 2-dc clusters as well. I used a 2-dc cluster because it is more chunky than a dc, without adding extra stitches. 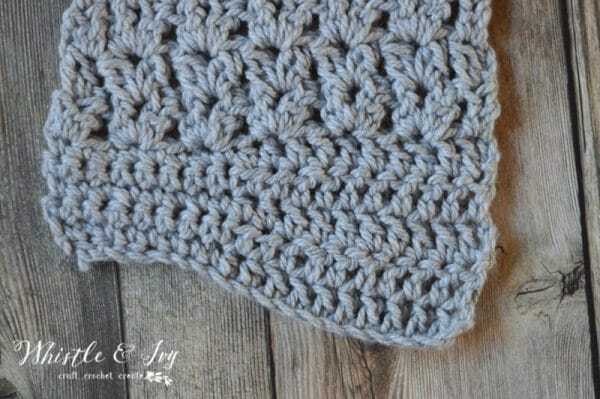 Think of this as a chunky v-stitch. 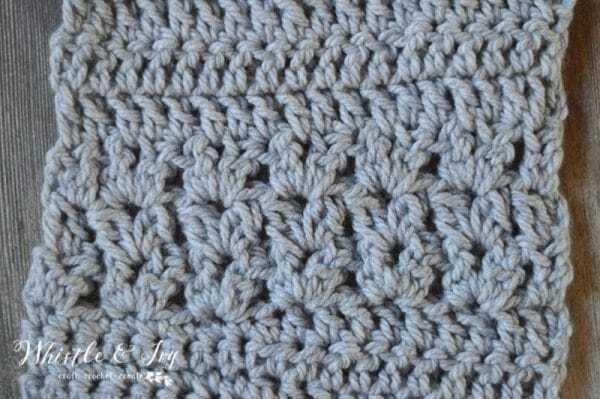 You will work one stitch, ch 1, then work another stitch in the same space, making a V shape. 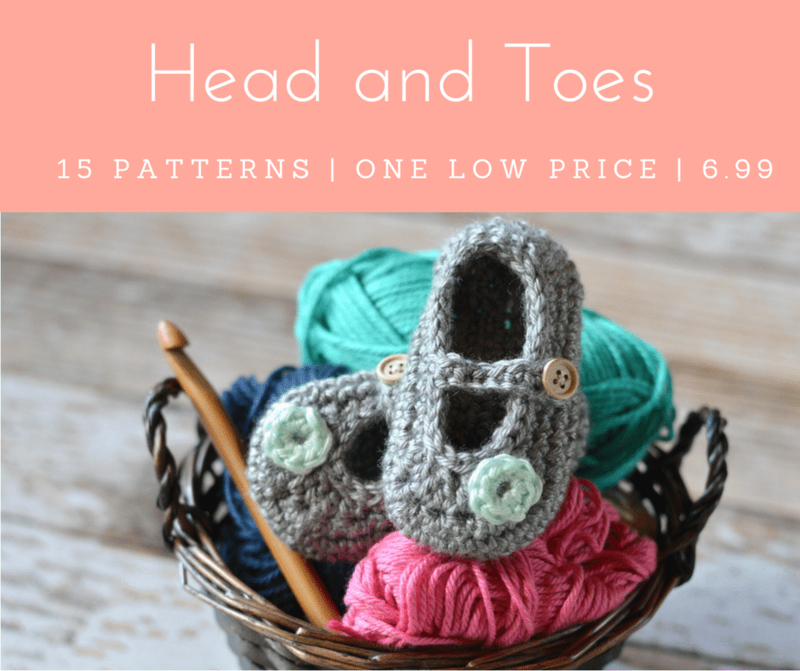 Special Stitch: 2 dc cluster – Yarn over, insert hook. Yarn over, pull through (3 loops on hook). YO, pull through first 2 loops (2 loops on hook). Yarn over, insert hook into same st, YO, pull through (4 loops on hook). YO, pull through first 2 loops. Yarn over, pull through last three. This stitch is basically a dc2tog, worked in the same st. 2 dcs on the bottom, but they share the 2 loops at the top. 2. Ch 1. Sc in same st. Sc 7. Hdc 2. Dc 8. Turn. 3. Ch 2. Dc in same st. Dc 7. Hdc 2. Sc 8. Turn. 4. – 5. Repeat 2 & 3 respectively. 6. Ch 3 (counts as first st). Work 2-dc cluster in same st. *Sk 2 sts. Work 2-dc cluster, ch 1, work 2 dc cluster–all in next st.* work 5 times. Sk 1 st. Work a 2-dc cluster in last st. Turn. (18 sts). 7. – 8. Ch 3. Work 2-dc cluster in same st. *Work 2-dc cluster, ch 1, 2-dc cluster in ch-1 sp from previous row. * repeat 5 times. Sk 1 st. Work 2-dc cluster in last st. Turn. Repeat rows 6 – 11 respectively until you have 96 rows (you will not work the last 3 rows of dcs to complete the last repeat). Your scarf should measure approx. 110″. 97. Ch 2. Dc in same st. Dc 7. Hdc 2. Sc 8. Turn. 98. Ch 1. Sc in same st. Sc 7. Hdc 2. Dc 8. 99. – 101. Repeat rows 97 – 98 respectively. 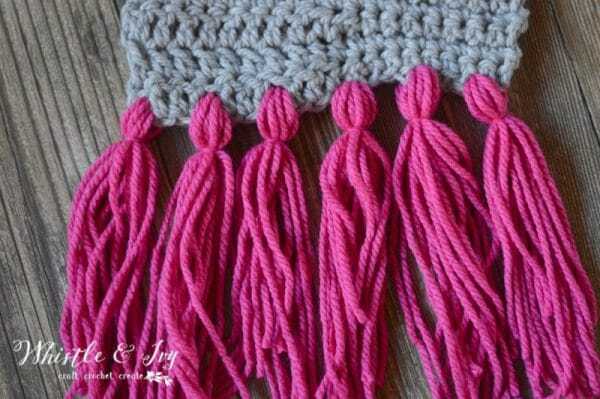 Finish your scarf by adding tassels to the ends. You don’t need a special tassel maker! 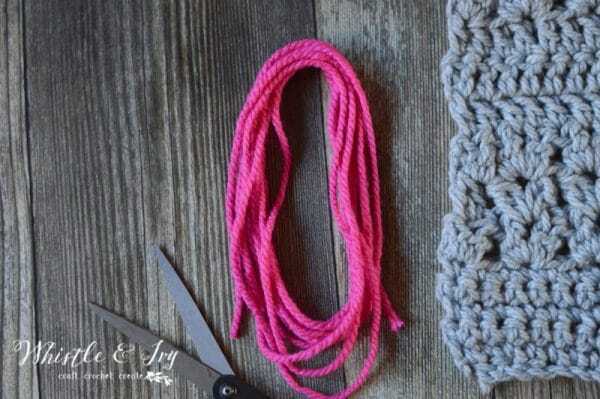 Simple loop your yarn about 8 times in a circle (the longer you make your loop, the longer your tassels will be). 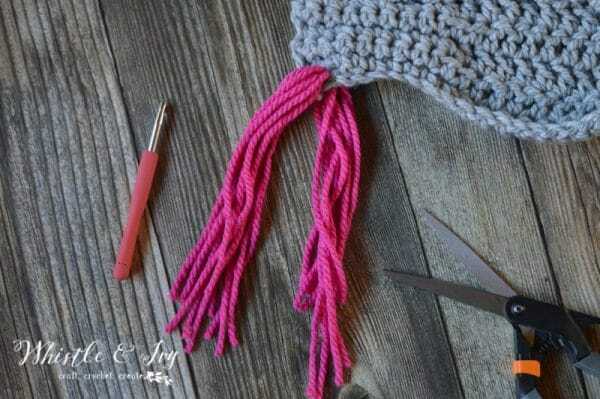 Clip the bottoms, and thread through the bottom of the scarf. Repeat 5-6 times, until the bottom has enough tassels for your liking. 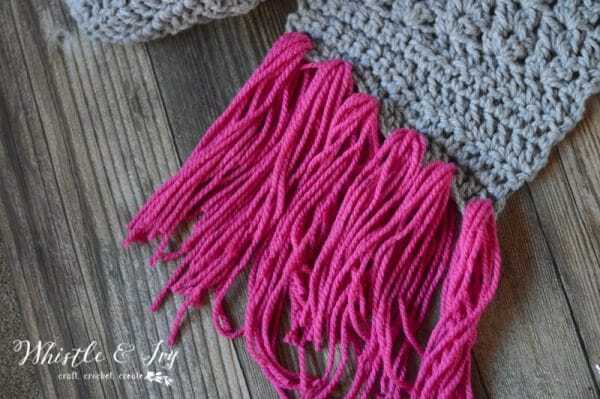 Tie a tight, small knot around each tassel to finish them. Clip the ends of your knot. I left my tassels with raw ends. I like that is makes the tassels look rustic. 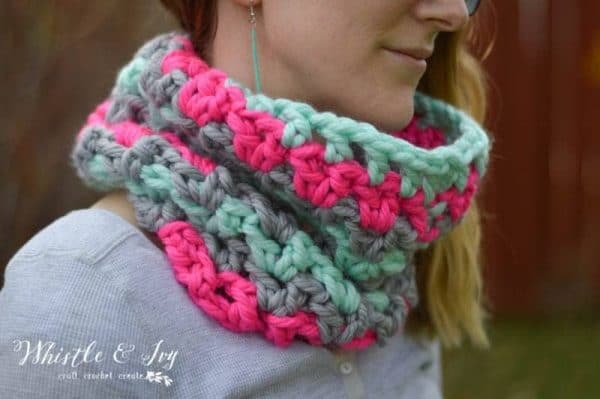 Are you ready to make your Super Scarf? 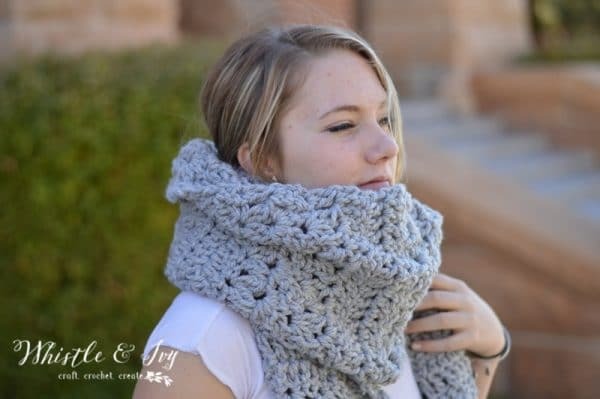 Be sure to check these other FREE Super Scarf patterns too! 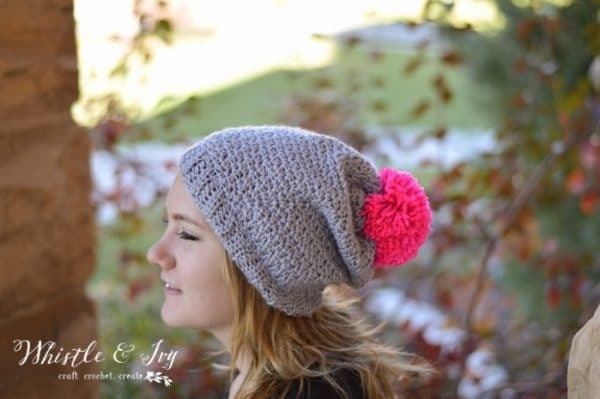 Like this free slouchy hat crochet pattern? Subscribe! Hi, I have a question regarding the first 6 rows. I’m wondering why they are not straight due to the height of the single crochet and then the double crochet? 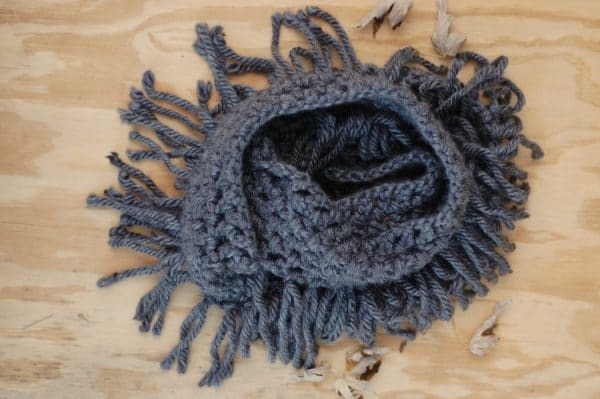 The scarf ends look tapers on one end. Is this correct? 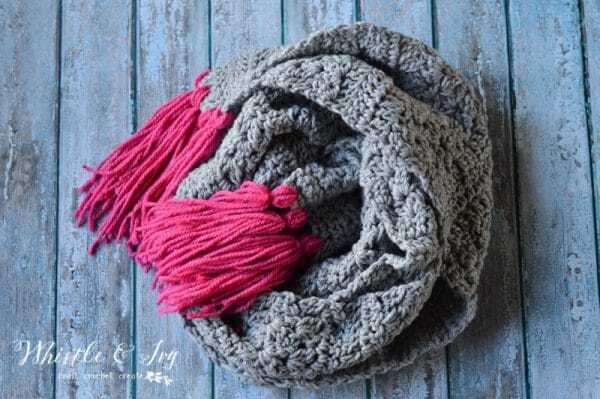 I have not seen a scarf like this on the ends so I’m curious why? Yes that is how I wrote the pattern, you are more than welcome to continue the pattern to have a square end. 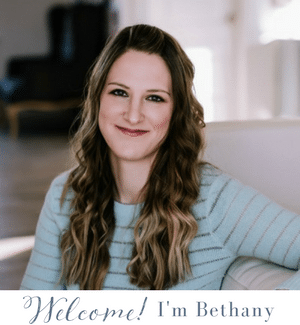 Thank you Bethany for a quick reply. I just wanted to make sure 8nwas reading the pattern correctly before I got too far. I love your work. My personal collection is fabulous. Looking forward to making the rest of the set of plaid.